Waggies Mobile Dog Wash is a professional dog wash & grooming service covering the following areas. Waggies provides a thorough and efficient dog grooming service to customers outside of their own homes for the ultimate convenience. 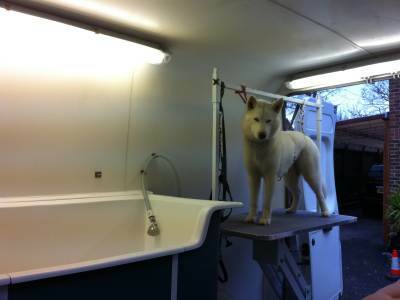 The professionally converted van enables customers' dogs to experience an enjoyable stress free groom. 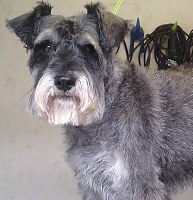 Waggies mobile dog grooming Portsmouth has experienced groomers offering a specialised service including time and patience for your pets needs while promoting the very best care during the treatment. 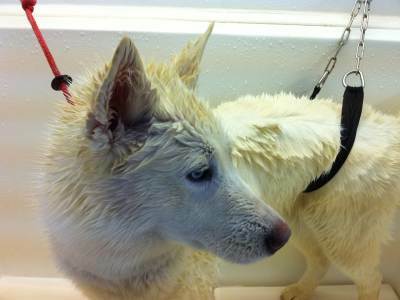 The company delivers various types of dog grooming from a wash to a full grooming experience. 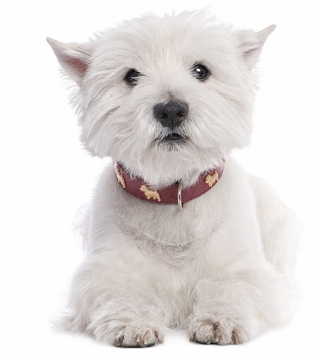 This service can be individually tailored to the requirements of the dog and their owner. Waggies Mobile Dog Grooming service has a large group of customers, based in and around the South East of England including, Fareham, and Portsmouth surrounding areas. Your pet could soon be beautifully groomed and washed outside your home without all the inconvenience of using a dog grooming parlour. A stress free way to have your dog groomed! How do we wash and groom your dog? Waggies's will arrive outside of your home at the agreed appointment time. 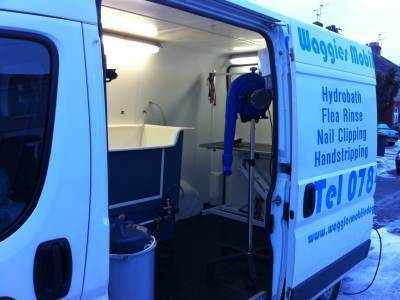 The van is fully equipped with a hydrobath enabling us to wash in warm water and groom your dog in safety and comfort. No more waiting for long appointment dates. No more transporting your dog to dog parlours leaving your cars ready for a valet. No more stressful waiting periods in cages for your pets while anticipating the groom ahead. This service is a kinder and more pleasant way to treat your loved one. The staff at Waggies Mobile Dog Grooming Portsmouth get to know your pet on arrival to make your pet and yourselves feel at ease prior to the process. Sometimes your pets have never experienced this procedure before and it is of up most importance your pet is relaxed and happy. A consultation will take place which covers medical and behavioral problems prior to the groom. This enables our staff to be aware of any contraindications and also to report back any physical changes to your pet which may need veterinary treatment. Your dog is invited into our van where he or she is attended to by one of our qualified groomers. Initially your pet is groomed and styled and during this time our staff will check the claws/nails and clipped if necessary. Your pet's ears are cleaned and an overall general check for lumps and bumps is undertaken. After the groom your pet is taken to the warm watered hydrobath where they receive a thorough wash with shampoos suited to your dog's coat, the coat is then rinsed and conditioned; a flea rinse is also applied if requested. The coat is then dried and deodorized with a selected coat perfume which leaves your pet in tip top condition at the end of the grooming session. We aim to make your dog a happy dog, as all dogs adore attention and care. We aim to make our customers happy with the professional service that Waggies provide. Using a specially designed hydrobath your dog will feel safe and secure. Before washing we will groom or clip the dog including nail clipping and ear cleaning. Washing includes a tea tree based shampoo and conditioner for dogs and we use an anti flea rinse. Your pet will enjoy the whole experience. Flea Rinse - Hand-stripping - All stress free outside your home! Waggies - dog grooming the easy way! 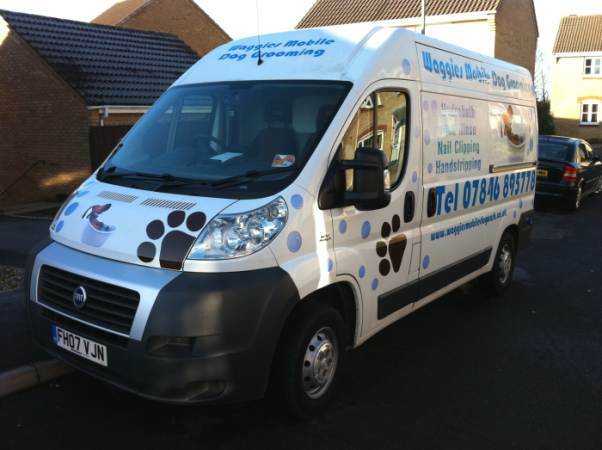 With the emphasis on delivering a stress-free experience for dogs and owners alike, Waggies Mobile Dog Wash Portsmouth brings professional grooming standards to customers. Waggies' staff has a commitment to your animals and give customers and their pets the respect that should be given when using such a personal service. Waggies' vans are equipped to a high standard which endeavours to ensure high levels of hygiene, comfort, and a calm environment to work within. The advantages of using Waggies can supersede the disadvantages of using a grooming parlour. No more travel dilemmas taking your pet to the groomers. No long periods of waiting times within the groomers for your dog causing distress and anxiety. Mobile dog washing is the new way forward in animal care. You can be sure of the quality and level of care provided by our staff. Waggies team are selected with a priority of genuine animal care qualities. The owner of Waggies, Angela Ross has completed various courses, grooming and training, welfare of animals and worked with dogs with behavioural problems. Waggies - many satisfied customers! Waggies boasts plenty of satisfied customers who feel strongly enough to leave extremely positive reviews of the service, e.g. 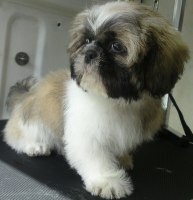 "Dean has just left us after grooming our Shih-Tzu Chloe. Everything about his service is exceptional. He took time to get to know Chloe, gave invaluable advice and really put us all at ease. Chloe came back looking great and smelling even better. It was a joy to meet Dean and I would recommend his service 100%. I will definitely be calling him again." Take a look at our testimonials page to read more. Waggies offers competitive rates and individual services tailored to the requirements of each dog and their owner. We offer various types of dog grooming from a wash to a full grooming experience. What people say about Waggies washing and grooming of dogs. Waggies customers trust the service and their testimonials show you that this is a very special grooming service for dogs. "When Honey returned we were thrilled, she was calm, happy and looked absolutely great." "It was very convenient and there was no need to worry as they were always right outside the door in the van." Shitzhu dog before his wash and trim at Waggies. Shitzhu dog after grooming by Waggies. A little shaggy before his wash & groom at Waggies! Now beautifully groomed, tidy and much more comfortable. "Dean spun his magic, both were groomed and look lovely, with no trouble at all." "The dog was not stressed or in any way affected by the experience." "Dean must have a way with animals as Rosie who is normally a nervous dog seemed quite happy in his company." "I have a Degree in Animal Management and also a career in the animal industry and therefore was very pleased to meet a dog groomer who was both knowledgable and skillful. I have just taken on a 4yr old cocker spaniel that has not been groomed in a long time, therefore covered in thick matts and knots and needing a lot of attention especially in awkward areas.. Dean was very professional, explained what grooming needed to be done and why. Dean was very good with the dog s nervous behaviour and offered excellent after care advice. I highly recommend Dean and will be using him on a regular basis." Second Chance Animal Rescue in Southampton Hampshire was founded in 1979. They hold the belief that no healthy animal should be killed because it is cheaper to kill it than to keep it alive. They have the conviction that, given time, a good home will be found for animals in their care and that, until it is found, they will provide a secure and comfortable home. Their loyal and dedicated supporters give their time and money so that animals receive a second chance at life. Please support Second Chance Animal Rescue by visiting their website and making a donation.